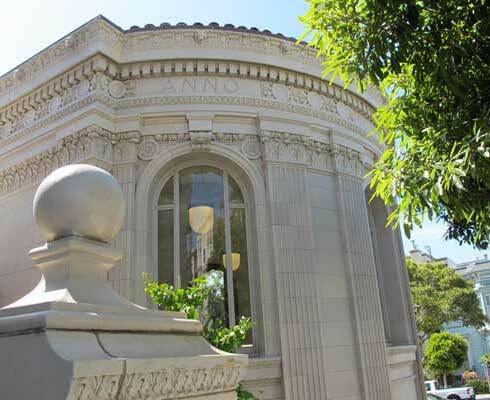 The Golden Gate Valley branch library stands at the corner of Octavia and Green streets. Although it is the name of the library, "Golden Gate Valley" is no longer in use for this neighborhood. This is generally considered part of the Marina District. In 1917, the city of San Francisco bought the land for $7,500. The library opened in 1918. The cost of the building and furniture was $43,000. This library is built of brick and terra cotta, designed in the beaux-arts style by English architect Ernest Coxhead. Beaux-arts architecture was popular in the United States from 1880 to 1920, and is characterized by sculptural elements and details reminiscent of classical Greece and Rome. Coxhead designed many churches and also did numerous homes in the neighborhood near this library. Golden Gate Valley branch is a small neighborhood library but the design is so impressive it looks like a grand, important building. If you step up close you can see the intricate patterns of the building's surface. If you step back you will see the harmony of the entire structure.